As a refurbished timber church from the 1920s, Church at Lyonville is one of the most distinctive properties in the region. This iconic property features three magnificent bedrooms, sleeping up to 6 guests. Church at Lyonville is an iconic, distinguished property which can sleep up to 6 guests across 3 bedrooms. The living area is open plan, with a large dining table, gorgeous couch and fully equipped country kitchen. Guests entering the property will be greeted by two rows of elegant trees along a country lane. As they approach, they will find the church nestled away in a charming garden. The property is painted a bright white, and lined with a rich brown wood which harks back to the Church’s original design. Light spills into the area through arched, stained-glass windows, giving the space a truly incredible atmosphere. At night, guests can light a wood fire to create a truly special ambience. The property’s 3 bedrooms each feature a large bed, with two bedrooms furnished with a Queen and one with a King Bed. One bedroom sits in a mezzanine, which overlooks the stunning common area. There is also a stylish, modern bathroom which is fitted with chic black tiles and a large spa bath. The property also has a second toilet. Church at Lyonville is situated only a ten minute drive from the heart of Daylesford. 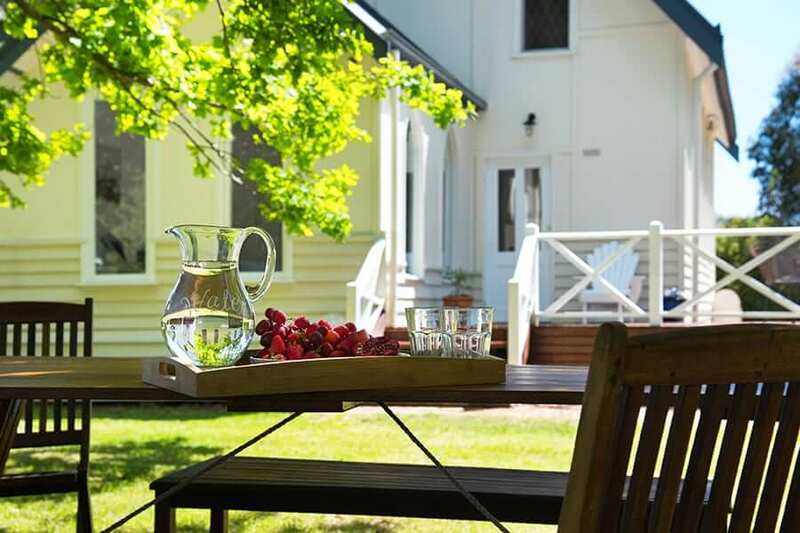 This means that the property is a fantastic way to escape the bustle of the city and experience the tranquility of the Victorian countryside, all whilst remaining close to everything which Daylesford and Hepburn Springs have to offer. The gorgeous township of Trentham is also only a five minute drive away, or a 6km walk through the forest along the picturesque rail trail. Children are welcome at the property! Provisions: Hamper of seasonally locally grown and sourced produce and treats, including essentials like tea and coffee. This accommodation is amazing from top to bottom- there is no denying the style, the comfort, the lighting, the surroundings, the compfy beds, the great pub around the corner, everything is totally perfect ! What a wonderful weekend we had and would absolutely highly recommend this place to stay. The Lyonville church is outstanding accommodation. Beautiful renovation, spectacular gardens and a local food hamper-delicious! Great place to stay if you are visiting the Radio springs hotel or would like a quiet spot to stay whilst visiting the area. From the moment we walked into The Church we felt peace and relaxation descend upon us. It really is a beautiful place with everything you need. Secluded and quiet - I haven't slept so well in ages. The tray of goodies was appreciated. Furnishings, crockery, appliances etc are all top quality. A great base to stay in to explore the area or just stay and enjoy the heavenly serenity. Church at Lyonville was just the weekend break we needed from busy lifestyles. The Church is beautifully appointed, super comfy and comes with everything needed to be self-contained. The beautiful fresh produce hamper was such a pleasant surprise and packed with so much delicious local fare. So much thought has gone into this unique beautiful accommodation, can't wait to come back but for a longer stay next time. Interested in what our other Daylesford properties have to offer? Take a look at The Garden House, a 1/2 acre property perched upon Wombat Hill, or consider our Group Stays choice for large gatherings (by booking The Manor House and The Station House as a combined package), or choose from any of our other options in luxury Daylesford accommodation.